Meat from pigs is a popular ingredient in different cuisines in Asia and in Western countries. Because of this, it is served throughout the day. The meat from the pig is known by some people as pork and some as ham. This is also the reason some people are confused with the difference of the two terms. In this article we will learn to differentiate pork from ham. Pork is what we call meat from a domesticated pig. It refers to pig’s meat from any part of the pig. In addition, it can be raw or processed for preservation. Ham, on the other hand, is pork that comes from a specific part of the pig – it’s hind leg. This portion is usually preserved through the method of salting, wet-curing, or smoking. Because of this, ham has a unique flavor compared to other cuts of pork. What’s the difference between pork and ham? Pork and ham have distinct characteristics in terms of source, flavor and intended consumption. Ham is from the pig’s hind leg while pork is any meat from pigs. Ham has a unique salty, sweet or smoky flavor, depending on the preservation process; pork does not have this unique flavor. 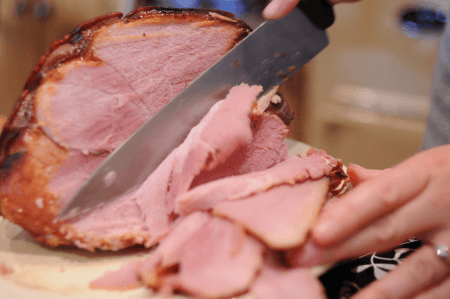 Ham is ready-to-eat because it was processed already while pork can be in raw form and require cooking before being consumed.